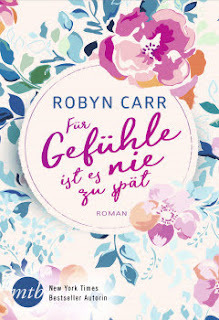 For the first time in my life, I read a Robyn Carr novel. And Never Too Late was a very good read. Romance, all kind of family troubles, totally different characters and a writing style that made me laugh and smile very often while reading. Sometimes you just enjoy a novel for the pleasure of reading. I had no expectations when I asked for this book. And the cover was no reason to want it. A bit too kitschy for my taste though I love flowers. Clare is done with her marriage when she finds her still husband in a very compromising situation. Only he thinks otherwise. And when destiny hits her hard and very cruel, Clare knows that she´s given the one in a lifetime chance to change something. She files for divorce gets back on her feet and starts all over. Only that life isn´t that easy to handle when you´ve come out of a life where you´ve only been a caring mother who put her own wishes and desires behind everything. The soft writing style with this incredible wonderful touch of humor made me sometimes laugh and very often smile while reading. There are so many hilarious dialogues, great scenes and the characters are so diverse that in the end, it all plays together very smoothly. The novel is a great combination of wonderfully created characters and things out of real life that could happen to any of us. Combined with the life of a small American town and a typical American family, you get the picture of romance, problems and trouble teenagers can cause. In the end, you are left with a smart woman who does her first steps as a single mother after a divorce and who learns that life has still some good things to offer. Three sisters who could not be more different. They all come from the same man but are as different as day and night. One is a typical mother who puts the well-being and woe of her family above her own needs and desires. The other is a conservative and highly controlled lawyer who suffers from the fact that her sisters or her father have never asked her for legal advice. The third in the league is a creative soul, which now presents itself as a gray wallflower after a very revealing defiance phase and can not do anything with the life of her sisters. I enjoyed reading this novel very much. A very soulful novel that knows how to kidnap the reader into a world in which not everything is just sunshine. Provided with beautiful scenes, priceless dialogues and an incredibly great sense of humor, this novel is very well suited for relaxed reading. At least I had my reading pleasure with it. *This book was kindly provided to me by Mira TB in exchange for an honest and unbiased review. Therefore, the cover of the German edition is shown first in this review. The novel was published Never Too Late by Harlequin Mira on May 17, 2016. 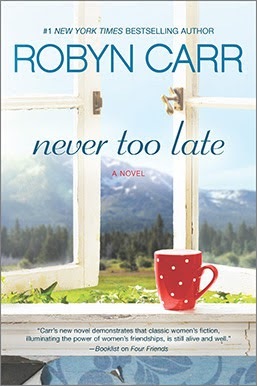 Robyn Carr is a RITA® Award-winning and #1 New York Times bestselling author of more than forty novels. Her work includes the critically acclaimed Virgin River series. Her novels touch on whether she writes them in the historical genre, romance novels or thrillers. Robyn remembers very well how she started her career as a writer 25 years ago. She was a trained nurse but was not able to take a steady job because her husband had to move professionally again and again. At that time, she read a lot – mainly from the genre of fantasy. During that time, she thought, “I can do that myself!” Her start into the new profession was difficult. She herself thought she had written a new novel with the class “Gone with the Wind”, but she was totally mistaken. It was a big failure. Only her third attempt was successful. Meanwhile, her two children are out of the house and she enjoys the great luxury of leisure. She has led a senior citizen group writing memoirs, is running a book club chat inside and outside the state and works in the local library. Robyn and her husband live in Las Vegas, Nevada. So glad that you enjoyed this one. Humor and good dialogue are the best way to win me over. Glad to hear that. Thanks for stopping by.